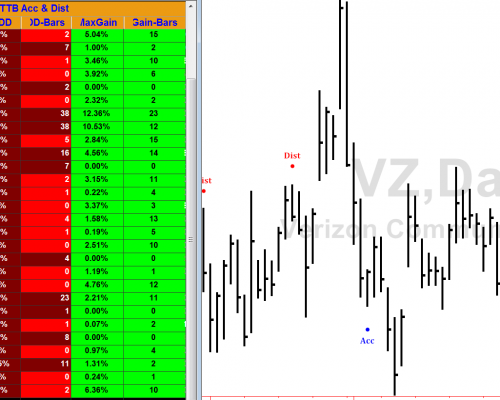 RADAR 1TM is a histogram which compares the relationship between price changes and volume changes to measure the ratio of buying strength to selling strength. 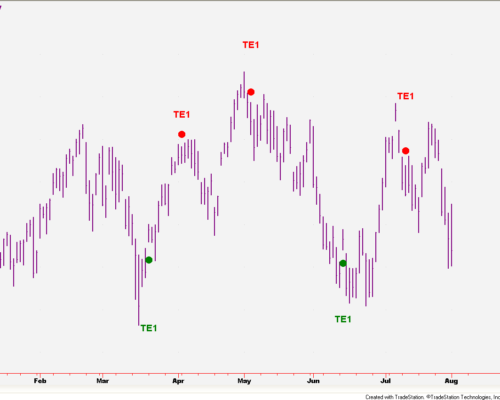 This tells us whether the Bulls or the Bears are in control at any particular point in time. It is an excellent oscillator for divergence analysis and for identifying trend persistence, and works in real time on charts in any time frame, either intrabar or end-of-bar. Please click here for more information on this tool. When an oscillator valley is shallower than its predecessor while the price corresponding to the most recent oscillator valley is lower than the price corresponding to the previous oscillator valley, a “normal” diverging condition has occurred which generally signals an imminent price reversal to the upside. Radar 2 Price LeaderTM is an excellent acceleration-based early warning indicator. 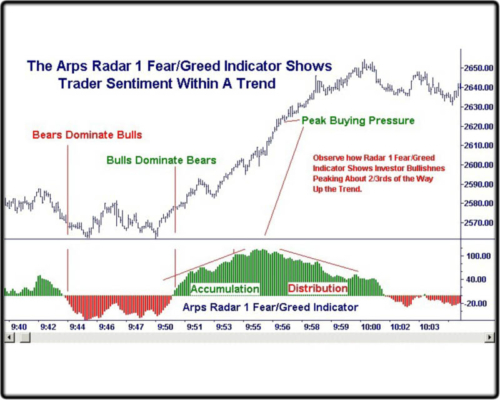 This indicator is very useful in all markets and time frames to identify impending changes in direction. A crossover of the red Fast Radar 2TM line over the green Slow Radar 2TM line signals an impending change in direction for the market. Price direction changes are confirmed by a crossover of the Slow Radar 2TM line over the 50 centerline. Please click here for more information on this product. 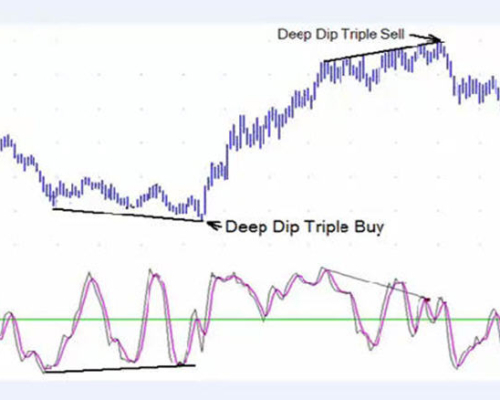 A paint-bar study designed to identify very short-term orientation of the price action. Perfect to filter entries for day-traders or for swing traders. Please click here for more information. 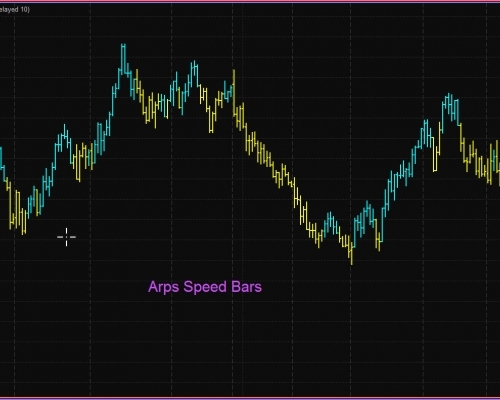 This toolset includes both the charting and scanning versions of the Arps Accumulation/Distribution signal. The charting tool is a signal-dot which identifies price and candlestick patterns that typify institutional accumulation and distribution of inventory. The Scanning tool is designed for scanners and spreadsheet analysis to identify these signals from a user defined universe of symbols. Please click here for PDF documentation with more detail on these tools. This charting indicator calculates a synthetic Volume Weighted Average Price from a user-defined number of lookback bars or a user-defined start time. 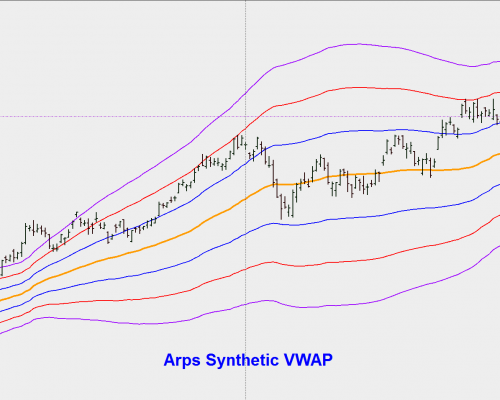 It then draws standard deviation bands around the synthetic VWAP creating channel analysis. Please click here for PDF documentation about this tool. 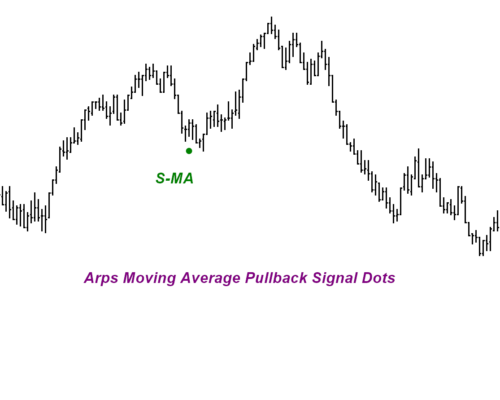 Designed to help identify qualified pullbacks to a set of moving averages. Includes a signal-dot indicator for charting applications and a scanning indicator for spreadsheet analysis (TS RadarScreen, eSignal Watchlist, MultiCharts Scanner) and for scanning operations. Spreadsheet analysis includes how many bars since the qualified pullback ( zero is the most recent completed bar), percent change since the signal, and indications whether the pullback was to a fast or slow moving average. Designed to help identify qualified pullbacks to a set of moving averages. 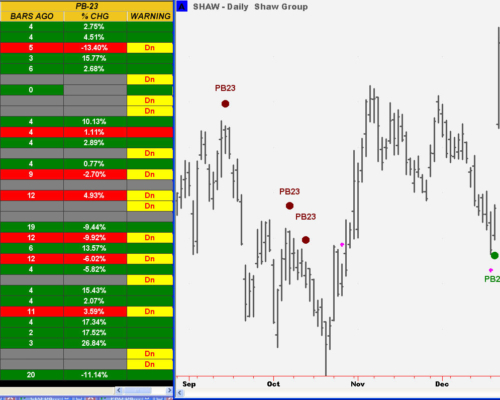 Uses three user-defined averages to identify and qualify the pullback opportunities. 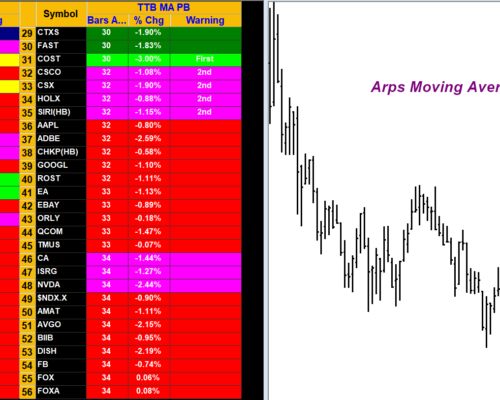 Shows separate signals for pullbacks to fast and slow moving averages. 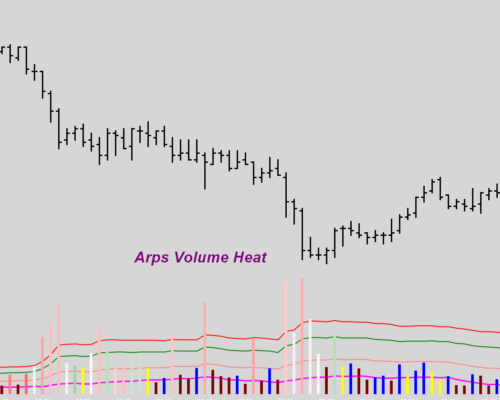 A versatile volume analysis indicator which eliminates distortion from extreme volume spikes and identifies different degrees of volume intensity by displaying standard deviations of an average volume. Includes color-coded volume divergence analysis as well. Please click here for PDF documentation on this tool. 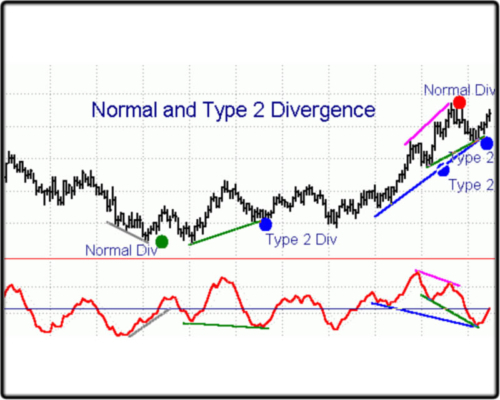 For technically-inclined traders, divergence analysis is recognized as one of the most reliable ways to identify the end of a trend and an impending major price reversal. This powerful tool set includes both the charting and scanning versions of the Arps Pullback 23 indicator. The scanning tool allows you to scan any large symbol list of your choice for recent Pullback 23 signals and then go directly to the chart to view the signal with the charting indicator. For pdf documentation with more information please click here . 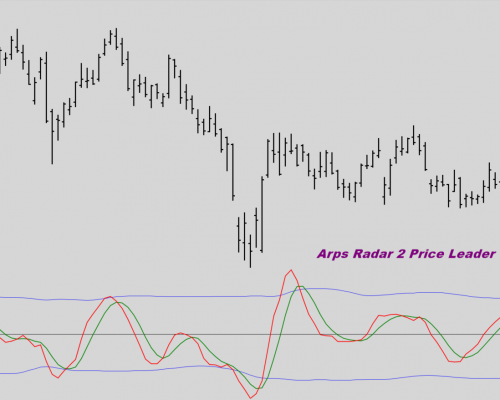 The TT5 Trend Exhaustion 1 tool uses the Arps Radar 2 Price Acceleration Oscillator to study the nature of price action to recognize internal signals which often lead to price reversals on the chart.